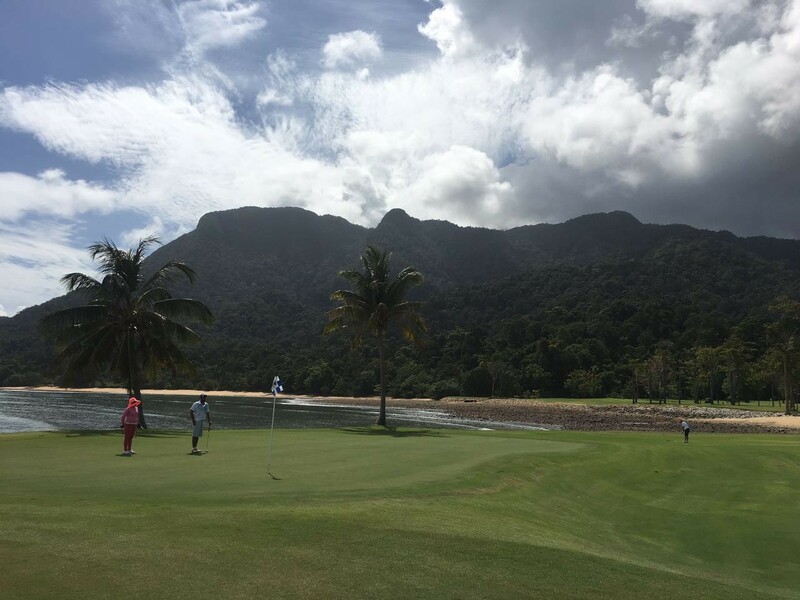 I have the pleasure to organise KL Expat Malaysia Golf Community and wanted to share with everyone who subscribes to KL Expat Malaysia our recent experience when 12 of us visited Langkawi for a Golf Weekend in early October. The Els Club is a 45 minute drive from Pantai Cenang (unless you choose to stay at the 5 star Datai attached to the golf course…). It’s worth the time, with the endless corners and the plethora of monkey’s warming themselves on the tarmac because, as you turn the corner before The Els, you get goosebumps….with a back drop of the ocean on one side and crispy green manicured greens with fairways as plush as an Axminster on the other. It’s all about the golfing experience and this is the ultimate. It just takes your breath away. A beautiful place to come and play golf, for all ranges of ability……It has no bunkers, the Satan of high handicappers!! On arrival you are met by bag handlers, not only to take your bag but to welcome you through in to the Clubhouse with a smile and a cheerful ‘Good Morning’……it’s always nice to feel welcome at a top course because sometimes that’s not the case, especially in Malaysia. Check in and registration is easy and you are then shown to the locker room, where you have your name on the locker and another warm welcome from the staff in the changing room…..the whole experience just makes you feel special !! Check-in, change and over to grab a nice hot coffee and breakfast and again the staff are great. I have had the chance to play 3 times this year at The Els and each time they remember your name….Thanks to Jenie for making us feel so welcome. Sitting in the open Clubhouse looking at the vast number of greenkeepers working on the course and the mountains in the background the immaculate lines where fairway meets rough just makes me want to play golf ……and enjoy the experience…..and most importantly play well. It’s on to the 1st tee…..and all I am thinking is ’please hit a good drive, please hit a good drive’ as I’m sure that the caddies will not be impressed if I don’t….and the other 11 guys behind me won’t be sniggering uncontrollably…..Phew, straight down the middle !! The opening hole is a great way to start, as are the first few holes. Not too wide, not too long and they ease you in to relaxing and enjoying the experience…..Oh, and did I mention, there’s NO BUNKERS or OUT OF BOUNDS…..This just gets better and better !!! 1-9 have a great range of holes with both short and long par 3’s, lay-up par 5’s and birdiable par 4’s…..it caters for high handicappers as well as low and the course makes you think about your next shot. The areas that impressed me most, unlike most courses in Malaysia, hitting wedge in to a green from 120 yards, it stops and you can pitch and run. The whole course caters for everyone. 10-18 have a slightly different feel to them with more angled fairways, blind shots, tricky lies and the 10th having an amazing view of the mountains in the background. Moving through the jungle and getting towards a hole I’ve been looking forward to playing, the 15th…..a par 3 raised up, not far at about 120 yards and boom, nailed it!!! I cannot express how much this course meant to me while playing, from the manicured greens, the flocks of parrots flying overhead, the Andaman Sea crashing over the rocks while I’m teeing up on the 17th, the GPS screens in the buggy helping you with distances, eagles circling, hornbills sitting in the trees watching us all go by and the backdrop to the whole course…..I could play this course every day for the rest of my life and be a very happy man. Thanks very much to Steven & his team for a great and memorable weekend at The Els Teluk Datai and we will see you in 2017 at both Langkawi & Desaru. This is the third time we have come to play The Els Langkawi and every time it never fails to disappoint. Even with the volume of rain that we have been experiencing recently, the course was still in excellent condition and the greens were as true as they always are. Course – On distance and paper, I thought this would be a walk on the beach; but it turned out to be a very clever set up course with hazards in the correct place. The views were stunning especially around the beach area and the greens have been kept in excellent condition, even being soft enough to allow you to fully attack any pin. I would recommend anyone to go and play this course but stay out of the jungle especially if you saw the dead dog on the 9th. Facilities – Excellent service and facilities. My favourite had to be the buggies with their GPS and allowing you to order food and drink anywhere on the course. I have also never had my name on a locker and been given tees, pitch mark repairer, balls with the logo of the course on them within our arrival. Staff/drink/food – Staff were absolutely great, very friendly and easy to talk too. Food was well timed and very enjoyable. I was very impressed that they even went out especially to get some beef bacon for the second day after it was requested. Caddies – Caddies were good and made me laugh, as they kept using my Rory the dog head cover as a puppet. It was a great weekend, well organised and everyone in the group was up for a laugh and couldn’t have been any friendlier. Massive well done to Duncan and Ian for sorting this out. I will happily come on the next outing but hopefully bring a better game. The fact I scored so badly but still enjoyed the whole weekend showed how fantastic the weekend was. Really enjoying the video’s and pictures but if I knew I was being recorded I would have pretended to have hit a great shot each time. Also better mention, I thought the prizes were very clever and made sure everyone had a chance on both days, even if they had a shocker on the first day. Course – Course was spectacular and in great condition. Caddies – Day one – Caddies were very pleasant and helpful. For putting did not have much input / knowledge (may not have helped anyway!!). Day two – Improved over Day One as more involved and provide good guidance on greens / lines etc. Food – Food and beverage team were excellent. Looked after us like royalty. Food quality and service excellent. Food quality very good for meals. Chef came out and met with us and was very personable. Reception / Org – On arrival well very good welcome and reception from staff. All very good and helpful. Course staff – Very polite and helpful. Management – Very helpful. Welcoming and a pleasure to spend time with. Excellent. Equipment – Carts all goof. Electronics great. Drinks staff always came when requested and timely. Improvements – None I can think of. Excellent. Highly recommend course and team. Langkawi, home of the white bellied Sea Eagle. There were plenty of white bellies on display at the KL Expat Golf Society tour but eagles of the golf variety were an endangered species. Birdies were also rather sparse however the standard of golf didn’t detract from a fantastic weekend. The Els club is a beautiful course, each hole perfectly maintained and sculpted into the landscape with great views of the surrounding mountains, beaches and the Andaman Sea. The service was first class, we were treated royally and everyone thoroughly enjoyed the weekend. Roll on the 2017 tour! The course was thoroughly enjoyable whilst being quite challenging it was in no way unfair and gave opportunities to score if you played good shots. Considering the amount of rain we had the previous night/morning the course was in fantastic condition and the greens were a joy to putt on. The service and food were brilliant and they even remembered my hot chocolate from the day before and brought me one on the 2nd day without asking. The only negative would be the caddies who need a lot more training up as were not very knowledgeable around the course.